Technological invention and domestic reform had an enormous impact on the evolution of the American kitchen. By the late 19th century, fewer women could rely on domestic servants; the housewife of the early 20th century required, and demanded, a more efficient kitchen in which to work. A wide range of cooking appliances and equipment emerged during this period, offering the choice of coal range, coal-and-gas range, gas burners to convert the coal range to gas, gas range, electric range, and oil-cooker. As electricity became less expensive, it gradually replaced gas. 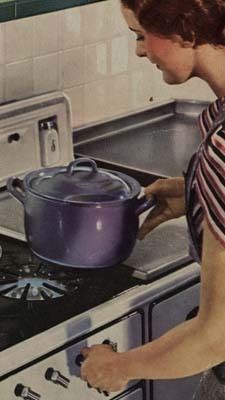 Although some originally feared it might cause electrocution, in fact, the electric stove proved to be safer than gas, which carried a risk of explosion. Another useful feature of the 19th century kitchen was the refrigerator, at first simply a lidless box containing a lump of ice. Finally, kitchen tools emerged to meet every conceivable "need," from coffee grinders to apple peelers to salad spinners. Perhaps no other segment of house wares is more characteristically American than the never-ending parade of products and "gadgets."